We got our best glimpse of Saturn’s largest moon Titan when European Space Agency’s Huygen probe was successfully dropped off on its surface by NASA’s Cassini spacecraft on January 14, 2005 — the farthest ever landing from Earth of a spacecraft. But the probe ran out of battery power in only a couple of hours. A team of scientists at Johns Hopkins University’s Applied Physics Laboratory have been itching to get back to Saturn’s hazy moon. But this time, rather than sending a stationary probe, the team wants to send a drone that could explore the moon from above its surface — but well below its thick, and nitrogen-rich atmosphere. “We didn’t know how Titan worked as a system before Cassini got there. We had tantalizing hints, but Cassini and Huygens really took it from [being] this mysterious moon to [being] a place that is incredibly familiar,” principal investigator for Dragonfly and scientist at Johns Hopkins University Elizabeth Turtle told Space.com. 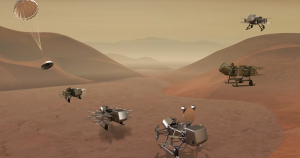 The mission called Dragonfly could eventually explore the most promising, and potentially habitable sites on Titan. Scientists are planning to take advantage of the moon’s low gravity, and thick atmosphere to visit multiple sites with the drone. And the proposed mission might actually take shape — that is, if NASA chooses it over a different finalist proposal later this year. NASA chose the two finalist concepts including Dragonfly for its next mid-2020s mission back in December 2017. The team behind Dragonfly submitted a more detailed concept back in December of last year, and are expecting a decision from NASA in the summer, Space.com reports. If chosen this year, the Dragonfly mission would launch around the year 2025 to arrive at Titan nine long years later. And they’re hopeful. “Not only is this an incredibly exciting concept with amazing, compelling science, but also, it is doable — it’s feasible from an engineering standpoint,” Melissa Trainer, Dragonfly’s deputy principal investigator, and scientist at NASA told Space.com.